Telescopic gates are designed to allow a sliding gate to take up less space to the side of the opening. This is ideal where a conventional sliding space will not work, as there is not enough space for the gate to slide into. As you will see in the video below we have created a system which affords a 5500mm gate to slide into a space of only 3200mm. Telescopic sliding gates work by individual sections of a gate that are linked together and overlap each other as the gate opens to cover a larger opening. As with all any other type of automatic gates system there will always be a degree of customisation, so therefore many of the technical components will vary, the size, specification of materials and visual appearance will always be different from project to project to ensure the operational and aesthetic requirements of the site are fully met. Technical factors that need to be considered are; level of security, usage, safety, integrating access control system and combining this with aesthetics and ease of use. Here are 3 advantages and disadvantages of a telescopic sliding gate system. Space- A telescopic gate will open into a space smaller than the entrance to which it is positioned. This is idea when a conventional sliding gate does not have enough space or parking space is limited and swing gate will not work. Speed- Telescopic gates move open and close very quickly. A lot of consideration needs to be paid towards gate safety (below). Security- Another advantage of telescopic gates are that they move incredibly quickly and cannot be forced open without exceptional leverage. Ground levels- An important consideration when deciding if a telescopic gate is suitable for the entrance is how the level the ground is, or can be made to be. As the system uses a track it is essential that the telescopic gate runs on a on level ground. We are currently working on a cantilevered telescopic gate system to overcome this issue and we will post updates when this has been mastered. Safety- If not set up correctly telescopic gates have the potential very dangerous. We will not fit railheads (spikes) on the top of the gate- because the telescopic sliding gate effectively becomes a giant hedge trimmer! We will also need to sheet the gate, open bars are not recommend at all because any body part that comes between the bars will be harmed when opening. 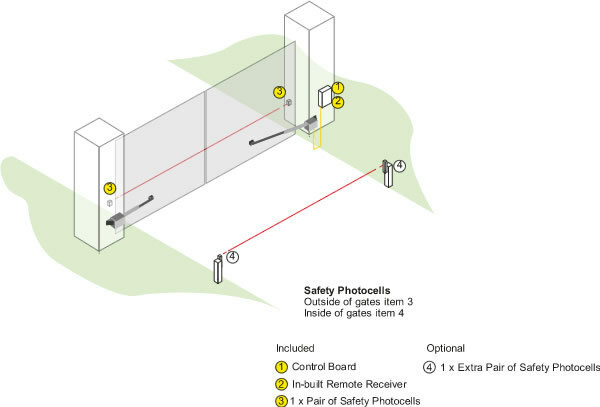 It is possible to have an open bar design with the use of laser safety curtain. Here is a recent installation of a bi-parting automatic sliding gate. A bi-parting electric gate was recommended to the client as a swing gate would have made the access in/out difficult via car and there was not enough room for a standard single sliding gate to run back into due to existing tree roots. The added advantage to a bi-parting sliding gate is that it opens twice as fast as a standard gate, and if done right it can be made to look like a pair of swing gates. During the design process we worked closely with the client to come up with a style they wanted to achieve and the drawings we created were used to apply for planning permission. This style of gate affords a degree of privacy from passing traffic but not completely enclosed. Once planning was approved (which did take several months! ), groundwork was started to excavate for the track. The track was skilfully excavated via a mini digger- great care was taken as there as a number of underground services that came up on a scan and needed to be avoided. The track is welded to a heavy duty RSJ. To reduce costs (or cut corners!) many other gate installation companies merely bolt the track down to a concrete base, the problem with this is that over time the concrete breaks up and the track will bend. By adding the additional RSJ this eliminates the issues and has a much higher capacity for weight loading. The track had to be aligned behind the existing brick piers and positioned in such a way that the gate did not fail on the pier caps as the gate opened, but not so far way that it would leave an unsightly gap. The rear of the track had additional paving slabs installed, to retain the earth and provide a nice neat finish as pictured below. The gates were manufactured using Iroko timber and had a built in steel reinforcement framework which helps support and stabilise the gate, provide torsion and prevent the timber from twisting, warping and moving over time. Subtle details were added to the gate such as carved banister rails, and we kept the open bars at the back of the gates even though it would not be visible from the front. To us, it’s equally important that the rear of the gate looks as well crafted as the font- especially for our clients as this is the side they will see more often! To ensure the sliding gates were safe we fitted them with a number safety edges to protect against crushing and two pairs of safely sensors in front and behind the gates to ensure it is compliant with safety regulations. We fitted a GSM Intercom, and a rear exit keypad. All the cabling was installed with great care and attention to detail to ensure there were no visible wires which is very important to attain a high end fit and finish. Both the clients and our team are very pleased with the outcome, if you have home in Surrey, London, Berkshire, Buckinghamshire, Hampshire, Kent or Essex and would like to see what we can do for you please get in touch we would love to help. Author David VieraPosted on January 11, 2017 Categories UncategorizedTags automatic gates, berkshire, Buckinghamshire, Driveway gates, electric gates, Electronic Gates, gate access control, security gates, SurreyLeave a comment on How much does it cost to automate existing gates? Domestic owners of electric gates are advised to keep them in a safe condition or face the possibility of being sued for negligence should anything goes wrong. An automatic gate is a machine and like any other, it poses potential risks to children and adults alike. In 2006, the first of a series of high profile child deaths associated with electric gates occurred, followed by the watershed moment in 2010 when two children died in separate automatic gate incidents in the same week. In 2014, two companies associated with one of the 2010 tragic child death incidents were convicted of breaching the Health and Safety at Work Act. Interestingly, the companies that were prosecuted were not the original electric gate installers but those who had been involved in repair and maintenance of the automatic gate since installation. Understandably today, those involved in repair and maintenance of electric gates are very cautious about the safety of systems they repair or maintain. We have a care of duty to inform clients of potential legal ramifications. Most serious injuries and fatalities occur by structural failure. Over the course of time, welds rust and fail, fixings become loose and foundations move. We were recently asked to attend a site where a heavy automatic metal gate fell on to a delivery driver waiting at the gates with a package. The gate was not fitted by us. The collapse occurred because expanding anchors (not rated for brickwork) used to fix the hinge had been installed in successive mortar layers which eventually forced the bricks apart. This should have been identified by a competent electric gate engineer during a service visit and rectified. The customer is currently being pursued in court as it is viewed that the homeowner had failed to take reasonable steps to ensure that the gate was in a fit state of repair. Unfortunately, the homeowner’s insurance company will not cover this claim as the pursuer’s injury, loss and damage were as a result of the defender’s failures and compensation in excess of £225,000 is expected. 3. Common Law – negligence. – Warning signs are in place. – Safety device function and response. – Condition of all safety edges. This is not intended as a definitive list but it does indicate the level of detail required. In most cases this must be accompanied by some specification detail for oils, greases and reference to any component specific manuals necessary to assist with the process. – Regulation 18 requires that workplace owners ensure their gate systems are safe and regulation 5 requires that they follow a system of planned preventative maintenance to keep the gate safe. – Section 3 places a responsibility on landlords and managing agents keep gates safe for tenants and other users; essentially follow a system of planned preventative maintenance. – The 1974 act also applies to workplace owners in tandem with the Workplace Regulations. This is common law (Roman law in Scotland) and means that any person who by their action or inaction causes injury to persons or damage to property may be sued in a civil action for damages. Hence anyone with responsibilities for powered gates could be affected. There is no criminal responsibility for a domestic owner of a powered gate, they along with everyone else could face civil action for negligence should anything go wrong. Here at Renzland Powergates Ltd, we appreciate the importance of detail. Over the following page you’ll find a breakdown optional equipment, as well as details of the comprehensive services and benefits that are available to every Renzland client on all new electric gate installations. So, have you ever wondered how electric gates open or close automatically when a car passes over? Probably not- but just so you can bore your friends at the pub, it is done by fitting a copper cable under the driveway linked to a detector, programmed to the gate control board. Still awake? Good! The induction loop creates a magnetic field. The gates will automatically open when a car/motorbike passes over the loop, as the metal in the vehicle is detected which triggers the gates to open . The cable will be fitted into a protective outer casing, buried into your driveway. This system is permanently active, however, at additional cost (around £80) it can be controlled during pre-determined times via a timer or turned off by a key switch. The cost includes labour of re-instating the driveway- please note we charge an additional £50 labour for block driveways as it is more labour intensive and time consuming ensuring the blocks are left exactly how we found them. Your electric gate system will come with two stylish and robust remote controls. If you require extra remotes, please select colour and number of buttons required. Each member of the family can have a different coloured remote control, therefore no more arguments over who lost a remote, which are always counter productive to a happy family life! FREE ON ALL ORDERS OVER £10k. In the event of a power cut the battery back up will open/close the electric gates up to a maximum of 25 cycles*. The battery will recharge once power is restored. Power cuts always happen during the worst possible time! “It’s really fun spending 20 minutes frantically looking for my driveway gate release key, then manually releasing my electric gates at 3am in the pouring rain, when I’m late for a flight” … said no-one, ever… Add this to your order to enhance your chi. *Varies depending on size/weight of gates. Only compatible with 24v Gate systems. As standard the electric gate system has a built in aerial which is good for a range of 30-50 meters depending on line of sight and atmospheric conditions. This is an additional antenna to improve and extend the range of the remote controls in rural or built up areas. Additional rear safety sensors (pictured above as item 4 – the bottom red beam). This prevents electric gates closing on cars parked within the arc/swing of the gates. Item 3 (the top red beam pictured between gate posts) comes as standard. This option is subject to our recommendations and site conditions. It is a high security/commercial grade solution and not recommended on softwood products or family residential homes. The perfect solution where rapid opening and closing manoeuvres are required, ensuring the shortest waiting time and the maximum security. You can have fast opening/slow closing and vice versa. Premium Quality GSM intercom crafted from marine grade stainless steel. Control your automatic gates from anywhere in the world. No internal wiring or redecoration as your land line phones are usually already in the most convenient place! Saves additional cost of remote controls, handsets, cabling, redecoration and fitting charge . The call can even be diverted to multiple owners. Enjoy increased security, as your visitor will be unaware whether you are home or not… ideal for those early mornings when you have uninvited in-laws or annoying door-to-door sales people visiting you. You can accept deliveries when not home, or even dial in to latch your gate open. Programming, faults and diagnostics available are in real-time, remotely reducing engineer visits. Cost does not include SIM card and ongoing call charges. Alternatively an ABS plastic version is available at only £695 + VAT. A high quality wireless intercom with a very long range; would be suitable for most residential and commercial properties. With extra handsets, you can use this as an internal intercom too. However, please bear in mind that adding more than two handsets will be cost comparable to a GSM system (which has more functionality). The external front panel has a neon blue back light for night time and is made from marine grade stainless steel with a toughened gloss acrylic front. This premium version of the AES 603 DECT Wireless Kit includes a built in, illuminated keypad for access control via a numerical code, so you can grant access to friends and family without them disturbing you. Another benefit for you, is the voice mail feature on the handset, meaning that when you return home you can check if you’ve missed anyone. You will never miss a call at your automatic gate again! Please click here for spec sheet. External keypad entry system to open the electric gates. Stores up to 99 codes. The keypad also illuminates at night. Really handy if you forget your gate remote when putting the bins out or you do not want to give children, gardeners or butlers a remote! A sleek contemporary light design to compliment your new automatic gate system. The light can act as a warning flashing light, or provide ambient lighting like a fixed courtesy light when the gates open. When connected to a 12/24 Vac/Vdc output, the light can remain permanently lit, and also be activated at dusk to then turn off at dawn thanks to the integrated dusk sensor. The lights can even be turned on/off using your gate remote control. Optimal efficiency, extra long life: the two 1 W-LED’s guarantee a lifetime of 70,000 hours (continuous use). Price includes fitting, cabling, protective ducting, ancillary components and power supply. Management of timed controls through the built-in weekly and hourly programme, fault finding display, speed, open delay and light settings. Wall mounted or comes with built in stand. These contemporary, beautifully crafted swinging gates were commissioned on behalf of our client in Coombe Park, Kingston Hill, Surrey. Renzland Powergates Ltd also designed these gates, which gave them added uniqueness and exclusivity. The brief was to provide secure yet attractive gates; safety, security, ease of use and aestetics were key requirements. The client opted for motorised gates (both “in” and “out” entrances), two pedestrian gates and matching railings. Both entrances were on a sharp slope; the bottom of the electric gates needed to be angled (racked) so it ran parallel to the gradient, while the rest of the assembly was square and true to it’s geometry. This avoids an unsightly gap underneath on one side. The automatic gate had to be carefully designed and fit to ensure it would not strike the driveway when it opened. The gates were hot-dip galvanised and powder-coated in gloss black. Access control operates via hand-held transmitters, hardwired intercom and keypad. This property is located on a highly sought-after area in Kingston upon Thames, Surrey; therefore only a high-end fit and finish was acceptable. Luckily, Renzland Powergates Ltd was the right choice to deliver a stunning entrance and the end result is another member of our network of happy customers! Its not every day you buy electric gates! To help you make the right decision, we have detailed three important points for you to consider when reading through a gate installers proposal. A vague proposal may infer that you cannot be sure of what you will actually get. It may also indicate a lack of certainty as to when/how they will commence and complete your project. The less detail in the proposal, the more opportunity to use inferior products. A poorly defined ‘scope of work’ or ‘recommendations’ may lead to additional, unexpected fees, since assumptions about the scope are made on both sides. For example, we recently lost a project based on a price differential of around £1,000 which to most people is a lot of money. Our competitor did not specify the electric gate motors they would use (a common trick- so clients cannot Google costs for themselves online). As it turned out, they used cheap, Made in China-produced gate operators which were woefully inadequate for the intended project and came with no warranty or UK customer support. Needless to say, the gates malfunctioned and were replaced at considerable cost. Furthermore, the metal gates were not galvanised and rusted within a few short months. In worst-case scenarios we’ve seen projects result in long delays, litigation and even complete failures to complete, while companies attempted to sort out these types of conflicts. Flaky, unclear proposals may indicate that the electric gate company hasn’t put any real thought into your needs nor made the effort to form a recommendation that would truly address those needs. Perhaps these companies are not seeking your best interests or a long-term relationship with you. Lastly, a company’s proposal is a reflection of their overall work ethic. If they present a quote poorly, how will they design and fit your gates? if it is not detailed, professional and presented in a timely manor how can you expect there work to be any different. “Electric Gates are really cheap!”…. Said no one. Ever. If other electric gate fitters are quoting significantly less than a competitor, be wary. If your quote is too good to be true, put on a helmet, get in crash position, and brace for impact because you may be setting yourself up for huge disappointment in the quality, execution and results of your project. A low ball proposal may infer that the company does not understand the real scope of work that is involved in making your electric gate design project successful. It might indicate a combination of incompetence, desperation and general lack of quality products and/or skill. NEVER buy into a gate company solely on price. A company that provides quality work does not represent the lowest cost provider in his/her own industry. A quality and trusted electric gate company with a proven track record will take great pride in the distinctions that justify their higher costs. The lowest bidder is a bottom feeder for a reason and you could be throwing your money away. If a company cannot provide evidence of sophisticated or custom-made projects, perhaps they have not completed any? A company that uses ‘copy and paste’ gates to churn out a string of run-of-the-mill tasteless cheap projects has not encountered any real challenges and most likely could not conquer them if they had to. To us, imitation is suicide. Avoid companies that cannot demonstrate their own complex work (e.g. around the corner gates, bi-folding gates, cantilever gates or large multi discipline projects). Talented engineers with professional skill sets do not come cheap! Also ask for before and during photos of portfolio pictures. Anyone can take a picture of an entrance gate- this is not evidence that they fitted it. Make sure your automatic gate company has a track record of successfully delivering a variety of challenging custom solutions, even if you feel your project is an easy one. It’s well worth choosing a company that can grow with you, so that you are not forced to part ways because of limitations to their abilities. Another high end installation by Renzland Powergates Ltd in East Sheen / Richmond, Surrey. We pride ourselves on delivering high quality custom designed gates and railings. We have a range of standard designs but can create and install exquisite bespoke wrought iron and metalwork to the client’s exact requirements. We can also custom make our own unique rail heads and components for one of a kind gates in our workshop in Essex- for the kind of high end craftsman ship we deliver you’ll find our rates highly competitive. As you will see from the pictures below the bricks were specially sourced to create a distinctive contrast the house face bricks, the gates were painted grey to match the timber window frames on the house. This East Sheen gate installation installation was completed with a high end access control system and heavy duty hydraulic gate motors. A recent case study for an electric gate system in Essex. This was a particularly tricky installation in a rural Essex location- there was no power to main driveway entrance where the gates were to be located. The environment was very boggy, wind affected and isolated meaning everything had to be over engineered to stand the test of time. A 75 meter trench was dug to connect the power. The posts were installed by using a 1 tonne digger as they were 3000mm long and weighed over 200kg each, this was an arduous process as the posts were sited directly above water mains pipes which had to be relocated. The posts had to installed perfectly aligned with no tolerance for error for the finished product to look right perfect. The huge Oak gate posts were buried over 1200mm in the ground and installed using over 6 tonnes of concrete (2 tonnes per post) this may seem like overkill but due to the weight of the posts and the clay ground we had serious concerns about subsidence over time. Every minor detail was taken into consideration- the post box was built into the pedestrian gate, the intercom was flushed into the oak post, cobbles were laid to give a definitive boundary and both the wooden gates (iroko) and the posts (oak) were treated with a special stain to ensure the color matched and appeared as through they are from the same species of timber. The hinges were specially made so they look beautiful from the inside with a distinctive studded effect on the front. When you are an electric gate installer making a beautiful timber gate and care about the final product, you’re not going to skimp and use a cheap standard hinges on the back, even though the untrained eye will not notice or appreciate it. We know it’s there, so we go the extra mile and fabricate a beautiful piece of sculptured metal on the back that curves with the gate. For us to sleep well at night, the aesthetic, the quality, has to be carried all the way through the entire gate project. If you are looking for an electric gate company in Essex that offer high quality automatic gates with taste, style and reliability please contact us to see how we can help. We offer Wooden Electric Gates, Sliding Electric Gates, Metal automatic gates and folding gates in Essex, London and most of the South East. Hi res pictures of all our electric gates installations can be found on our facebook and google plus page. Bespoke electric driveway gates in Cobham Surey. Another high end electric gate installation for an in and out driveway in Cobham, Surrey. Renzland gates were selected over a number of other gate installers that cover Cobham. The property itself has been featured on TV and have won awards for design so it was imperative the driveway entrance matched the unique design and high end quality of the house. Provide a structural survey before commencing works- including CAT scan for underground services. Renzland Powergates Ltd designed, built and installed 2 x bespoke Iroko gate entrances for a property in Cobham, Surrey. The gates were designed to match the oak framework on the clients home with hand carved house name with raised dowels detailing. The unusual apex feature on the gates is made from oak along with the gate posts with the rest of the gates being made from iroko. Over time as the wooden gates weather down, the English oak detailing will give a creamy white grain and subtle defined contrast from the golden, warm-brown texture of iroko. This in itself is a challenge as the oak element is a solid block of 4000mm x 2000mm timber which will move at different stages so the gates were designed and built to allow for shrinkage and movement which is unavoidable on large timber electric gates. Custom made gate hinges were forged so that they can be adjusted in the future to allow for gate movement, even the nut heads were sourced especially to match the raise dowels. An effort was made to hide all cabling when most gate installers simply clip cable to the posts; alot of our work will go noticed, however we intrinsically believe there is a tonne of work in between very good and great. The gates were finished by a french polisher to give the gates a very high end fit and finish. Hydraulic underground gate automaton was chosen due to its better performance with wind effected gates. Where budget allows we always recommend hydraulic gate automation over electro-mechanical. The BFT gate motors we use are virtually bullet proof- although no one at here at Renzland gates have actually fired a gun into a gate motor to prove this statement. Whilst electro-mechanical gate motors do work well and offer cost savings- would you rather have a gate motor that essentially amounts to a window wiper operator, or hydraulic pumps that work on the same principle used to raise bridges (tower bridge) or operate large digging machines and cranes? We design and build electric gate systems to last for 15 years + not to fall apart inside 3 years. The existing gate intercom was re-used but upgraded with a GSM module so our client can speak with visitors from anywhere in the world (with a telephone signal). Stage 2 for this Cobham project will be landscaping, feature lighting to illuminate the carving on the gates and CCTV package. Overall we are very pleased with the way the project was executed, but most importantly glad to have another satisfied client in Cobham that has already recommended us to a number of prospective customers in Surrey, London and Berkshire.